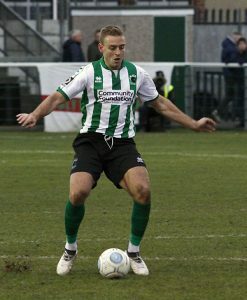 Louis Laing felt Blyth Spartans matched National League leaders Leyton Orient in their late FA Trophy defeat on Saturday. Spartans were six minutes away from setting up a replay with The O’s on Tuesday evening before Jamie Turley inflicted a cruel blow on Alun Armstrong’s men. It came in front of the excellent 289-strong travelling supporters at the Breyer Group Stadium, who showed their appreciation for Blyth’s tireless efforts at the full-time whistle. “It’s disappointing, it’s not what we deserved,” said Laing, after completing his second consecutive full game. Armstrong opted to field three central defender – Louis Laing, Nathan Buddle, Jordan Watson – in order to nullify the hosts’ attack – and Laing believes the system had a positive impact. “We did well through all of the game – I thought we matched them everywhere. We got the formation right. It was just one of them things. Orient, who were only relegated from the Football League in 2017, are on course to return – occupying top spot with a three-point lead over close chasers Salford City and Solihull Moors. Just four seasons ago, the margins between the two clubs were far greater with Blyth competing in the Evo-Stik Premier while The O’s just missed out on a place in the Championship. Laing said: “Look at Leyton Orient. They’re a big club. They’re top of the National League. “We’re a good team – but like you said, we’ve matched them throughout the full 90 minutes. Next up for Blyth is Darlington in the National League on Saturday, with Tuesday night’s Northumberland Senior Cup clash with Newcastle U23s set to provide an opportunity for fringe and reserve team players to stake a claim. And Laing, who will be rested in midweek, is looking forward to the rest of the season as Spartans turn their focus towards the league, with a playoff spot very much still up for grabs. “I’m enjoying it being back. Obviously last week against Hereford, I was a bit rusty! “I hadn’t played since the last time I was at Blyth, so I think I’ve found my feet now. “I enjoyed the game today. I feel like I am fit now.